1.6 "Provost Steamroller Rolls On…"
4 "Rolling back the right"
Denise Provost is a Massachusetts legislator. In 2001, the Boston Democratic Socialists of America Exec Board recommended that members vote to endorse incumbent Alderman-at-large Denise Provost in Somerville, and Felix Arroyo for an at-large City Council seat in Boston. 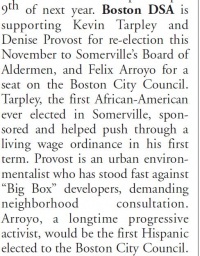 On August 18 2001, Boston Democratic Socialists of America Summer conference voted to endorse Denise Provost and Kevin Tarpley for re-election to Somervilles Board of Aldermen and Felix Arroyo for an At- Large seat on the Boston City Council. In her first term as one of Somervilles four At-Large Aldermen, Denise Provost has stood fast against Big Box developers, demanding neighborhood consultation. An urban environmentalist, she has pushed for neighborhood community gardens and has been a strong advocate for expanded public transportation, calling for a T stop at Assembly Square, a Union Square stop on the commuter rail line, and a Green Line extension. Her supporters include Boston NOW, the MA Womens Political Caucus, and Ironworkers Local 7. The September 2005, members meeting of Boston Democratic Socialists of America voted to endorse two candidates for re-election this November 8: Boston City Councilor At Large Felix Arroyo and Somerville Alderman At Large Denise Provost. "Both have been consistent and creative advocates for social and economic justice." In her 6 years on Somerville’s Board of Aldermen Denise Provost has been an articulate proponent of socalled “smart growth”, in partic ular her courageous and sometimes lonely opposition to “Big Box” development in Assembly Square. She is a past board member of the Association for Public Transportation, and is pushing for a Somerville stop on the Green Line. Her supporters include Boston NOW, Progressive Democrats of Somerville and the Sierra Club. DSAers in Boston and Somerville received a mailing endorsing both these candidates in early October, and have been participating in their campaigns. According to Boston Democratic Socialists of America newsletter, The Yankee Radical, March 2006. We (Boston Democratic Socialists of America) continued our electoral work with the Massachusetts Alliance (formerly the Commonwealth Coalition), a grouping of unions, civil rights groups and other progressive forces who strive to provide effective support in a targeted number of state legislative races. Through the Alliance we strengthened our relationship with key allies and, by door-knocking, phone-banking and mailings, helped elect Linda Dorcena Forry, Chris Speranzo and Pat Jehlen to the State House. Boston DSA also supported (on our own) the successful City Council re-election races of Felix Arroyo in Boston and Denise Provost in Somerville. Our plans for 2006 include projects voted as priorities by DSA’s recent National Convention, especially focusing on the low-wage economy (i.e., Wal-Mart, healthcare). And we’ll maintain our involvement with the Alliance—currently we’re working on the State Rep. races of Claire Naughton in Foxboro and (again on our own) Denise Provost in Somerville. On January 10, the DSA-endorsed candidate Denise Provost won a landslide victory (62%) in the special election for State Representative in Somerville’s 27th Middlesex District. Somerville DSAers were mobilized with a campaign mailing and follow up phone calls, and several were active members of Denise’s campaign committee. The special election was held to fill the vacancy created when Pat Jehlen was elected to the State Senate in another special election. Denise, a three-term Somerville Alderman-at-Large, was supported by Jehlen, and also by State Representative Carl Sciortino, who represents the north and west sections of Somerville along with parts of Medford. Denise now joins Jehlen and Sciortino to give Somerville one of the most progressive delegations in the state. Having already “topped the ticket” as the highest vote-getter in Somerville’s municipal elections in November, Denise’s State Rep landslide victory now constitutes a ringing endorsement not just of herself, but of the progressive politics that she champions. Provost was described as a "long-time ally" in DSA's Democratic Left, Winter 2006/2007. In November 2008, several candidates for the Massachusetts legislature were endorsed for the November 4 election by Mass Alliance, of which Boston Democratic Socialists of America was a member. These included House candidates Willie Mae Allen , Cory Atkins, Jennifer Benson, William Brownsberger, James Cantwell, Lori Ehrlich, Gloria Fox, Denis Guyer, John D. Keenan, Jason Lewis, James O'Day, Glenn Pare, Matthew Patrick, Denise Provost, Pamela Richardson, John W. Scibak, Carl Sciortino, David Sullivan, Martha Walz. 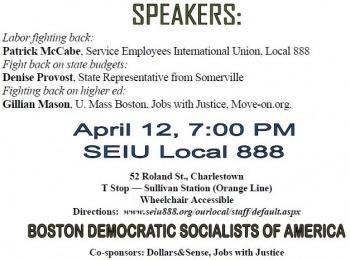 On April 12 2011, Boston Democratic Socialists of America held a forum "Rolling back the right: false problems. real solutions to the Budget crisis." at the SEIU Local 888 HQ 52 Roland St., Charlestown. Fighting back on higher ed: Gillian Mason, U. Mass Boston, Jobs with Justice, Move-on.org. 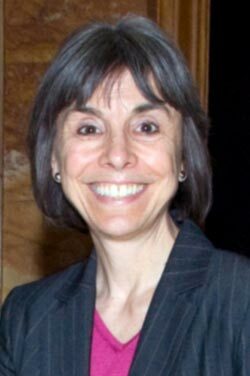 Denise Provost is a Berniecrat, is a term used for those democrats (generally) running for office who have expressed support of former presidential candidate Bernie Sanders. This page was last modified on 5 September 2016, at 22:08.